I was feeling a bit creative for Valentines Day this year, what do you think? 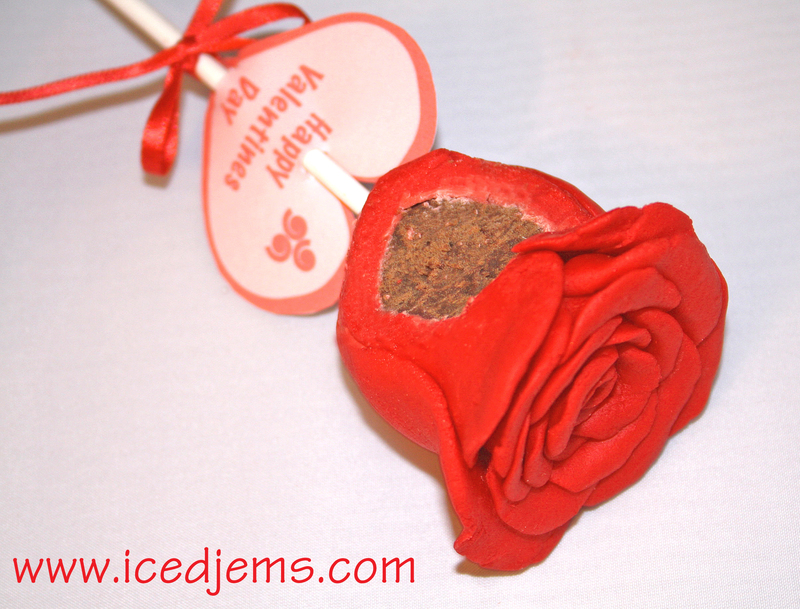 A beautiful Rose Cake Pop! I have to give credit to the amazing Chris White for his photography skills. 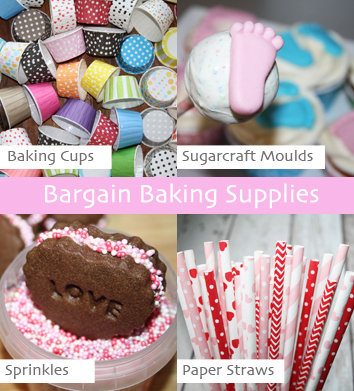 I made the cute Cake Pop labels too – you can download them for Free at the bottom of this post! 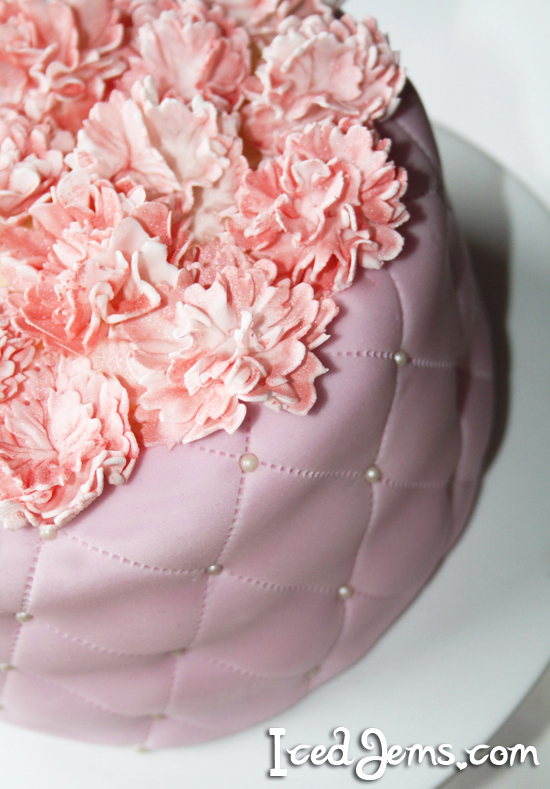 Oh and the best part – the rose petals are made from Marshmallow Fondant so it tastes amazing! 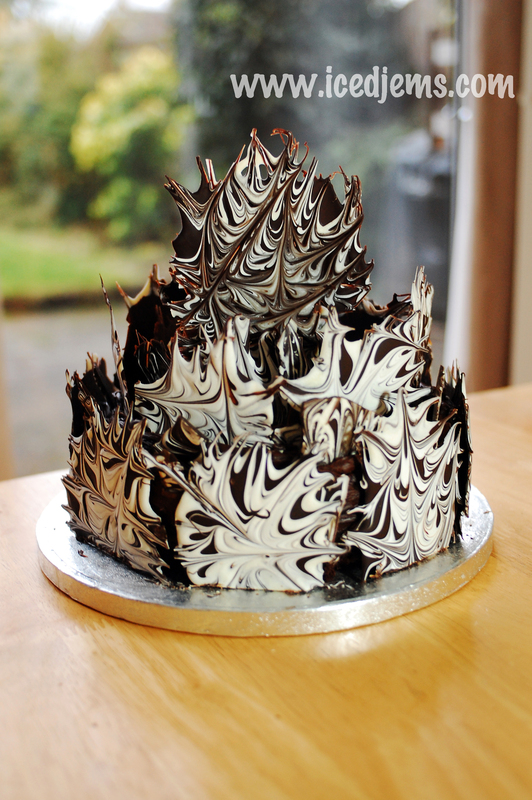 The Chocolate Cake centre – I’m drooling just writing about them. Ok, so want to know how simple it is to make them? Break up your chocolate cake into small pieces, then rub between your hands until you have cake crumbs. Melt 250g milk chocolate in a small bowl, then stir it into your cake crumbs until you have a thick dough consistency that can be rolled into shapes. Roll small 3-4cm wide balls of cake pop mixture, then flatten the top of the balls ( so your rose top has something flat to sit on later). Transfer to the fridge to set and firm. 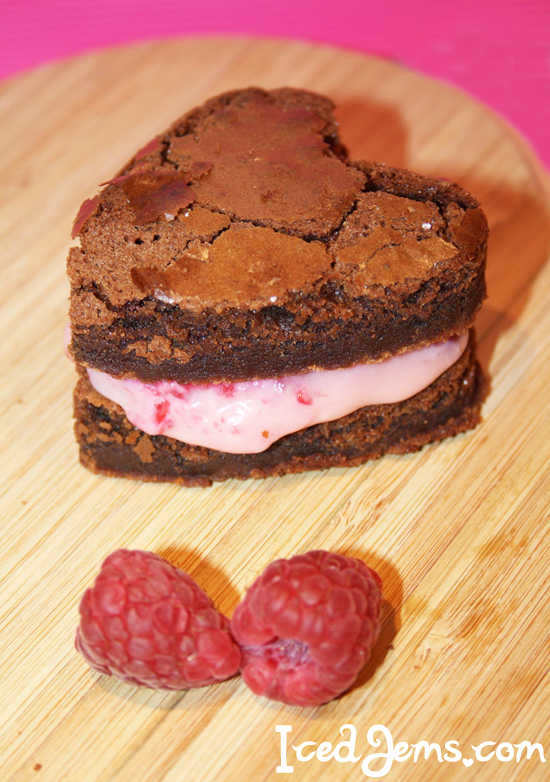 Melt your red candy melts. Push a lollipop stick into the top of the cake pop about 5mm deep, then pull it out, dip it into the candy melts, then push it back in firmly and repeat until all your cake pops are finished with sticks. Microwave your marshmallows and water in a large bowl, for 30 seconds at a time until smooth – stirring at each 30 second interval. Once smooth and a thick liquid/paste consistency – stir in your icing sugar, 150g at a time. 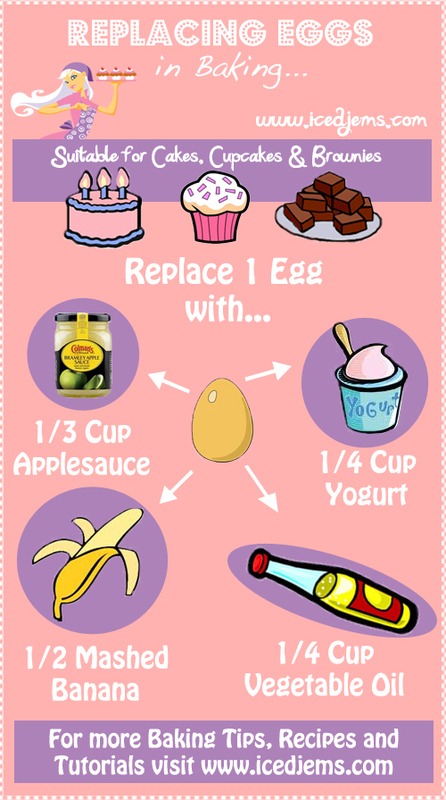 This can be hard going, so if you have a stand mixer, feel free to use it! Once combined, colour and roll out on a surface coated with icing sugar or cornflour to stop it sticking (marshmallow fondant can be stickier than regular sugar paste / fondant). 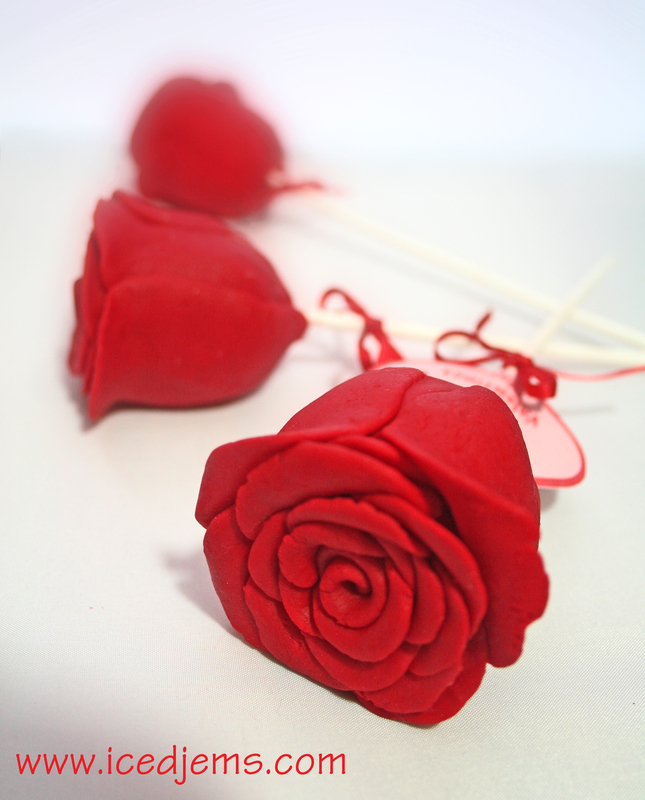 Grab your Marshmallow Fondant (or normal fondant, or modelling chocolate), make a long oval shape and roll it up to create the centre of your rose. Then add semi-cirle shapes to the outside (getting gradually bigger) to create the rose petals. 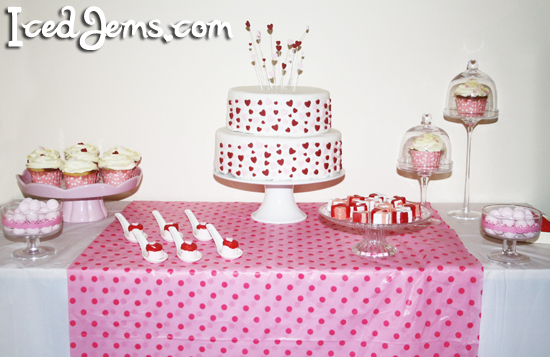 Keep adding petals until you have a width slightly larger than the cake pop. Now for the petals that cover the sides, make sure these are long enough to reach from the top of the rose to the lollipop stick. Its candy melting time! I made my cake balls in a slightly triangular shape as shown above. Just dip the lollipop stick in the melted candy and halfway into the cake ball. Once the stick has set into place, dip the cake pop into the candy to completely coat. 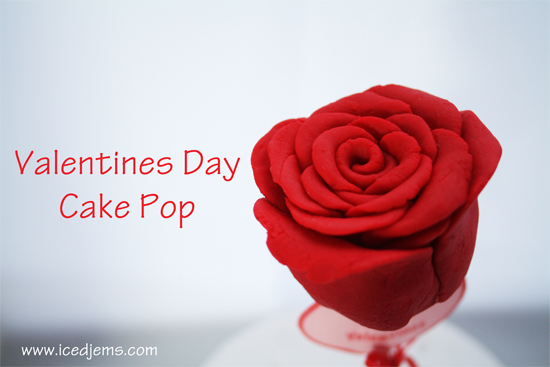 Now you can grab the top section of your rose and position it on the cake pop. And finally you can add the larger petals around the sides until completely covered. See, it really was simple! 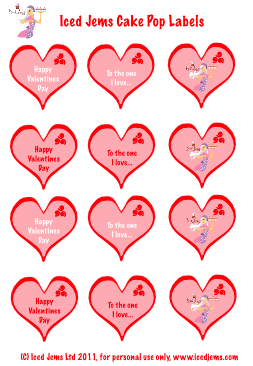 And I’ve even created the Cake Pop Labels for you to print! I hope you enjoy making these and coming up with different styles and colours! Love it. I tried doing it from the base of the cake pop and it just wound up being too big. Thanks so much! I can’t wait to try it this way. Those look like they would take forever, but they are so very cute! I’ve been lucky enough to sample these and they really taste as good as they look ! These are by far one of the best looking cake pops I have seen! So beautiful! I don’t know what marshmallow fondant is but I am going to look it up now! Thanks for posting! What’s the “Melted Candy” made from? Am I missing something? These are spectacular! I stumbled across this site purely by accident after seeing the pancake pic in facebook. Your posts are very creative and I am drooling at the creations. Tried to find a follow this blog option for regular but could’t find it 🙁 Please add one so people can get regular updates. Will drop by soon to check out more posts. Hi! I love this tutorial. I will try it.. I have a question… how do u “glue” the semi circle shapes and petals to each other? Thanks. I love this I’m very excited to try and make my own. Good luck to me….